Audio: Listen to a podcast about this article. Satellite dishes dot a surprising number of rooftops in Wallacedene, an informal settlement in Cape Town, South Africa. The gray saucers, as seen in the satellite view on Google Maps, are one of the few signs of modern amenities in a densely settled area that otherwise resembles a shantytown. In developing countries, building regulations hardly exist. Can a push for research and education change that? MEMBERS ONLY Listen to a presentation from the 2018 NFPA Conference & Expo in Las Vegas on a 2017 project to introduce smoke alarms into informal dwellings in South Africa. Read a report on the South African project. Watch a short film documenting the fire problem in South Africa’s informal settlements and how smoke alarms are being used to fight it. Read about a research project led by Stellenbosch University and the University of Edinburgh, with involvement from NFPA, on improving the resilience of informal settlements to fire. Read a report detailing the World Bank Group’s efforts to make informal settlements safer globally through its Building Regulation for Resilience Program. Read a study from the International Journal of Environmental Research and Public Health on methods of conducting fire risk assessments in informal settlements globally. Located at the eastern edge of Cape Town, about 15 miles from the South Atlantic Ocean coast, Wallacedene is home to about 36,000 people. The settlement covers an area about the size of 100 football fields, resulting in a population density that’s over six and a half times higher than that of New York City. Homes and businesses are little more than crude shacks, built with sheets of corrugated metal, oriented strand boards, plastic tarps, and other scrap materials. Trash is strewn about empty lots and along the settlement’s narrow streets. The crowded and ramshackle living conditions in informal settlements create significant fire hazards. Census data indicate that, while less than 20 percent of Cape Town’s population lives in informal settlements, more than half of the city’s fires occur in those areas, according to published sources. Risks associated with the built environment are compounded by the absence of regulation and by hazardous human behaviors like smoking in bed, leaving burning stovetops unattended, and overloading electrical circuits. The result is frequent fires that can rapidly grow out of control and raze entire settlements, destroying thousands of homes and displacing thousands of residents. One such fire last year, in a settlement known as Imizamo Yethu in Cape Town, killed four people, destroyed nearly 2,200 homes, and displaced 9,700 residents. The blaze, which cost the city an estimated 100 million South African Rand, or about $6.7 million, was one of the worst in the city’s history. NFPA’s Research Division is assisting the University of Edinburgh and Stellenbosch University, in the Western Cape province where Cape Town is located, with a project to study how fire spreads in these settlements so that its effects can be more effectively mitigated. In at least one part of Wallacedene, though, progress has been made using a single, simple piece of technology: smoke alarms. The Wallacedene Temporary Resettlement Area (TRA)—a 16-acre neighborhood with a population of roughly 4,500 people and a history of frequent fires and other safety hazards like flooding—was the site last year of a government-led project that introduced thousands of battery-powered smoke alarms into the homes of residents. According to project organizers, the results have been nothing short of astounding. In Wallacedene, most residents still heat their homes with traditional devices called mbawulas, 25-liter metal cans with holes punched in them for ventilation that are filled with smoldering embers. For cooking, tiny kerosene stoves, often called paraffin stoves, are common. Both the mbawulas and the stoves have sparked fires; the Paraffin Safety Association of South Africa estimates that more than 200,000 South Africans are injured or lose their property in paraffin-related blazes every year. But electricity, recently introduced to Wallacedene as part of a government effort begun in the 1990s to provide informal settlements with legal electrical power, also poses dangers. Data from the Cape Town government shows electrification in informal settlements like Wallacedene has coincided with a 335 percent jump in electrical fires in these areas, many tied to overloaded circuits as residents cram appliances—refrigerators, stoves, and, apparently, televisions and satellite dishes—into small spaces. A report published in May on the Wallacedene smoke alarm installation project indicates residents of the Wallacedene TRA perceive appliances like electric stoves as safer than gas stoves, which might create a false sense of security and result in more fires started by unattended cooking. For years, solutions to fires in informal settlements like Wallacedene came by way of various fire detection and suppression products hawked to residents and municipalities by manufacturers, some more concerned with turning a profit than with offering legitimate solutions, Eksteen said. The products were rarely backed by any science proving they actually worked. In developed countries like the United States and United Kingdom, battery-operated smoke alarms are a tried-and-true technology. They’re generally required in multiple locations in dwellings, and organizations like NFPA have touted their importance for decades. In developing countries, though, it can be an entirely different story—South Africa, for example, has no requirements for smoke alarms in dwellings, formal or otherwise. Even with the technology ingrained in the fire safety culture of the developed world, smoke alarms remain an underutilized tool. NFPA data shows smoke alarms are absent or inactive in three out of every five home fire deaths in the U.S. Often, nuisance alarms, or instances in which alarms sound because of day-to-day activities like cooking, cause people to disconnect them. 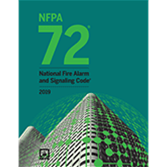 NFPA 72® has the most advanced provisions ever developed for the application, installation, performance, and ITM of fire alarm and emergency communications systems. Little wonder, then, that when Eksteen and others from the Western Cape government, as well as researchers at Stellenbosch University, devised a plan about two years ago to introduce the devices into informal settlements, many said it simply couldn’t be done. “There was this belief that because these are informal settlements and because people are using open fires to heat and cook in their dwellings, there’s going to be smoke all over the place, and these devices are going to be going off all the time, and it’s just not going to work,” Eksteen told NFPA Journal in an interview in September. Even some local fire departments doubted smoke alarms could be used in informal dwellings, he said. But Eksteen had seen research supporting their effectiveness in similarly small spaces like mobile homes and campers, and he wondered why they couldn’t be used effectively in the shacks that populate the informal settlements of the Western Cape. 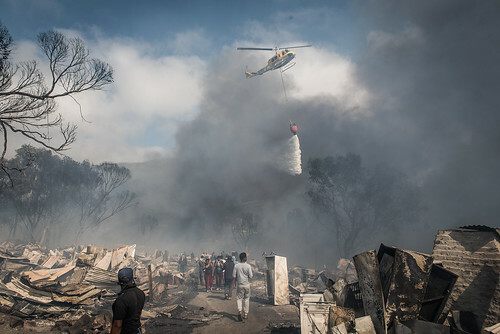 Eventually, one fire department—the Breede Valley Fire Department, which Eksteen described as “very progressive”—agreed, and in the spring of 2016 it worked with the government and researchers to install 200 battery-operated smoke alarms in informal dwellings in two informal settlements, Zwelethemba and Avian Park. The project was an instant success. Alarms immediately began alerting residents to potentially life-threatening fires, Eksteen said, and residents who hadn’t been given the devices came asking for them. The research paved the way for the larger project in the Wallacedene TRA that began about 10 months later, in February 2017. Project leaders were still wary, though, unsure that the success of the earlier, small-scale project would translate to success on a larger scale. Even so, about 2,000 off-the-shelf, photoelectric alarms with long-lasting lithium- ion batteries were purchased for the Wallacedene project. Researchers had determined through the earlier project and subsequent research that photoelectric smoke alarms—as opposed to ionization smoke alarms or rate-of-rise heat detectors—were best suited to detecting the kind of smoldering fires that plague South Africa’s informal dwellings. Early in the Wallacedene project, Eksteen began to hear stories of how residents escaped death or injury because of the alarms. One of the first stories involved an elderly man who returned home from a night of drinking at a local gathering place called a shebeen. He started cooking but fell asleep. A fire started on the stove and the smoke alarm sounded, prompting neighbors to rush to the dwelling, kick down the door, and throw the flaming pot outside. The incident convinced the handful of Wallacedene TRA residents who had initially refused to accept smoke alarms to ask for them. In another incident, an elderly man who had also come home after drinking at a shebeen fell asleep in bed while smoking a cigarette. When his bedding caught fire and the alarm sounded, neighbors responded and were able to pull him outside. As the shack went up in flames, the responding residents pushed down its four walls and smothered the fire, preventing it from spreading to nearby dwellings. The man they dragged to safety sustained only minor burns. “That’s really when I realized the potential for these devices, seeing the community response,” Eksteen said. “Because these shacks are so close together, when the alarm activates, the neighbor responds. And that time from activation to response is often so short. Even in situations like your bedding catching fire, where you’re very intimate with the fire, it’s literally just the equivalent [for people accustomed to larger, formal dwellings] of someone running to the next room to help you.” Additionally, he said, smoke alarms “can also prevent firefighters from being exposed to the kind of hostile situations” they can encounter when desperate residents are trying to save their properties from a well- developed fire. Key to making the smoke alarms a success in Wallacedene were the efforts of researchers to educate residents on the importance and proven success of smoke alarms, using materials from organizations like NFPA. Researchers collaborated with the community by employing residents, mostly young people who were in need of work, to go door to door educating residents on the importance of smoke alarms, as well as actually installing the devices. Working in pairs, one person would educate while the other would install, Eksteen said. They used the NFPA slogan from 2015’s Fire Prevention Week campaign—“Hear the beep where you sleep”—to persuade residents to have the alarms installed near their beds. For all the positive results that emerged from the project, it wasn’t without its challenges. As anticipated, nuisance alarms sounded in some cases when residents cooked—especially meats, which produced smoke—or when they used mbawulas for heating. Some residents devised clever solutions around the problem. One resident, for example, would remove his alarm and wrap it in clothing every time he lit his mbawula, Eksteen said, letting the smoke die down before reinstalling the alarm. Other nuisance alarms, however, weren’t as easy to avoid. Researchers believe insects crawling into—and nesting and defecating in—smoke alarms caused a significant number of nuisance alarms. Building regulation experts say as much as 80 percent of the built environment in developing countries was created without regulatory tools such as codes and standards. “A very significant part of the built environment globally is informal, which means not benefiting from land-use regulation or building regulation as it relates to safety,” said Fred Krimgold, a senior consultant with the World Bank Group’s Building Regulation for Resilience Program. This means an enormous number of people are at risk for dying in fires. Over 300,000 people around the world die each year in fires, with about 95 percent of deaths occurring in low- to middle-income countries, while millions more are seriously injured, according to a study published last year in the International Journal of Environmental Research and Public Health. The Wallacedene project and similar efforts offer hope. Historically, Krimgold said, research on improving safety in informal settlements has focused on the threat of massive, acute disasters like hurricanes and earthquakes—events that generate dramatic headlines but that don’t necessarily offer an accurate representation of the most consistent threats faced by the people living in these areas. Focusing instead on day-to-day, chronic threats like fire is the better approach to creating a safer environment, he said, which is why the Building Regulation for Resilience Program is focused on learning more about those threats.